With more than 19 years of experience at producing handcrafted iron doors, driveway gates and iron railings, Colletti Design's hallmarks are its dedication to design, innovation, engineering and above all else, quality and service. 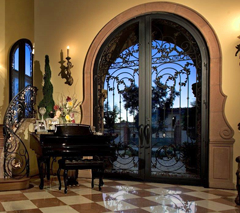 The artisans at Colletti Design create handcrafted iron doors, steel windows, steel doors and iron gates from the treasury of great designs in their collection. They appeal to every architectural style including Mediterranean, Old World, Spanish and timeless Contemporary. And they do it while honoring the company’s commitment to quality, designing and engineering their products using metals such as stainless steel, bronze, aluminum and brass. Architects, builders, developers and savvy homeowners choose us because they know our commitment is to creating works of art that meet their demands.